According to IBISWorld Research, the auto transport service industry is quickly headed towards $11.1 billion in yearly revenue. More industry growth means more eager new companies entering the market. This means consumers need to be extra diligent when looking for a reliable auto transport services company. So, how much does it cost to ship a car, and how do you find a reliable company? The average shipping cost for a compact four-door sedan is between $600 and $1,000. Meanwhile, the average shipping cost for a pick-up truck, small van, or SUV is between $800 and $1,070. However, the average cost of shipping a car also depends on several variables, some of which vary based on location or the time of year. We’ll cover each of these variables in this article. We’ll also share a few smart tips on how to select a dependable auto transport service company. Vehicle shipping companies employ over-the-road truck drivers. The longer it takes these drivers to make the trip, the more the auto transport service company has to pay them. Naturally, this cost is factored into the service and passed on to the customer. This is why it’s a good idea to avoid shipping a car during peak travel seasons because the additional traffic can make the trip longer and the service more expensive. For example, contrary to common opinion, the day before Thanksgiving is not the busiest travel day of the year. Christmas time is busier, so is the 4th of July, Memorial Day, Spring Break, New Year’s Eve, Labor Day, Easter and Mardi Gras season. Fridays during the months of June, July and August are the busiest days for travel. Geographical location also makes a difference in considering the time of year to ship a car. Vehicles are shipped by large tractor-trailers (for shipping multiple vehicles) or by single truck trailers (for shipping single vehicles). Vehicles shipped overseas are loaded onto cargo ships. Since all these vehicles run on gas, gas prices become a big factor in the average cost of shipping a car. The greater the distance between the origin and final shipping destination, the more of a factor this becomes. Think of it like calculating the cost of a road trip from Tampa, Florida to New York City, which is about 1,128.9 miles on Google Maps. The average tractor-trailer (which runs on diesel fuel) gets between six and seven miles per gallon. According to the United States Department of Energy, the cost of diesel fuel in April of 2008 was just over $4 per gallon. Meanwhile, the price per gallon in September 2018 was only about $2.76 per gallon. This means the Tampa to New York City trip would have cost about $752.60 in April of 2008, but only $519.30 in September 2017 when diesel prices were closer to $2.76. These varying gas prices are used to calculate the average cost of shipping a car. When customers contact for a quote, they use the make, model and year of the vehicle to determine the length, width, height, and weight of the car. All of these are factors in the price of shipping the vehicle. At first glance, this doesn’t appear to be much of a difference. But the estimated volume of the Ford F-Series is about 746 cubic feet, compared with the estimated volume of the Camry which is 451 cubic feet. On top of this, the weight of the 2018 Toyota Camry is between 3,241 and 3,572 lbs, while the average weight of the 2018 Ford F-Series is about 4,069 to 5,265 lbs. Since the Ford F-Series weighs more and will take up more room on the transport rig, the Ford F-Series will cost more to ship than the Toyota Camry. With open shipping, the vehicle is loaded onto a double-decker framed trailer with between two and eight other vehicles. These vehicles are often seen on the highways since they’re used to transport new vehicles to automobile dealers. However, shipping a vehicle across the state, or the country, does carry minor risks in terms of exterior vehicle damage. Dirt, rocks, sand or gravel kicked up by other cars can cause dents, scratches, chipped/broken glass fixtures and minor wear on paint jobs. This is why some prefer enclosed shipping because of its extra layer of protection. This “velvet glove” service is preferred for customers shipping classic, high-end, or exotic vehicles. With enclosed shipping, the vehicle is placed inside a metal, covered carrier either by itself or along with three to five other vehicles. By using enclosed auto shipping services, customers get the peace of mind that their vehicle will arrive at its destination in the exact condition it left. BEWARE OF INDUSTRY LINGO: Auto shipping companies will sometimes use “covered transport” and “enclosed transport” interchangeably. However, the two are quite different in price and service quality. Covered transport means that the vehicle is shielded with a canvas-material, having a few holes to facilitate airflow. Conversely, enclosed transport means that the vehicle is transported beneath a solid, metal covering. While both covered and enclosed transport offer more protection than open transport, enclosed transport offers the most and is considered the premium service for keeping the vehicle in pre-transport condition. Auto transport service companies ship vehicles from an “origin” point to a “destination” point of the customer’s choice. The most common and cost-effective way to do this is through terminal to terminal shipping. All vehicles are shipped from one vehicle shipping “terminal” to another. Auto shipping companies use these terminals for fast, easy loading, storage, and unloading of shipped vehicles. People who choose terminal to terminal vehicle shipping services will drop their vehicle off at the terminal closest to the vehicle’s origin point. Once the vehicle has been shipped to the destination terminal, the customer picks the vehicle up at the terminal. These terminals are usually located near airports. However, they can also be just off major highways (especially highways which travel through cities). These highway side terminals are especially common in large cities like Los Angeles or New York City where it’s nearly impossible to drive a 75-foot rig through the busy city streets. Since about 80% of the population lives within fifty miles of one of these terminals, terminal to terminal transport is an easy and cost-effective solution for most customers. On the other hand, some customers prefer an extra layer of convenience and opt for door to door vehicle shipping. With door to door service, the vehicle is shipped from the origin terminal to the destination terminal. However, the auto transport service company also picks up the vehicle at the customer’s preferred location (usually their home) and takes it to the origin terminal for shipment. 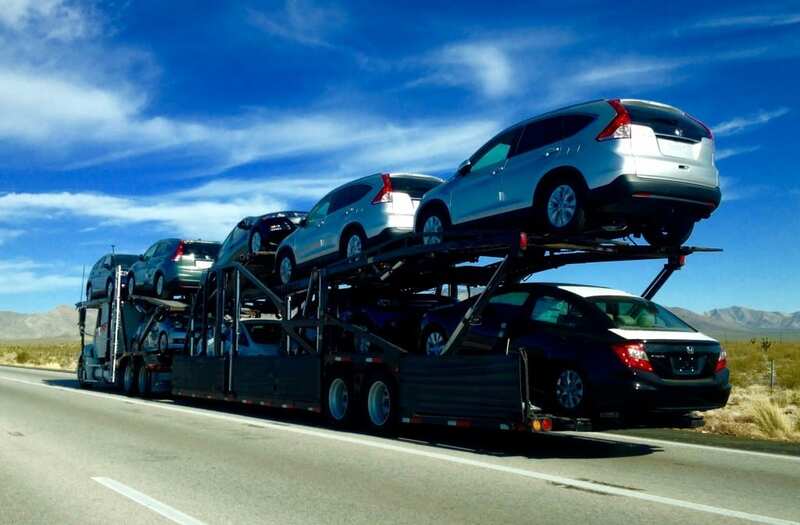 Once the vehicle arrives at the destination terminal, the vehicle shipping company delivers the car from the terminal to a destination of the customer’s choice. Door to door vehicle shipping carries a premium cost. However, it saves the customer the time and hassle of dropping off and picking up their vehicle. Time/Season (high-traffic seasons are more expensive than low traffic seasons). Gas Prices (higher gas prices mean a higher cost to ship the vehicle). Vehicle Size (the vehicle’s length, height and width and weight all factor into shipping price). Terminal to Terminal vs Door to Door Delivery (door to door being the premium, higher cost service). Open Transport vs Enclosed Transport (enclosed transport being the premium, higher cost service). It’s important that the car being shipped is properly insured, but not over-insured. For example, customers with non-operational vehicles should consider ensuring the vehicle, whether they’re currently driving it or not. If the vehicle is operational and insured, the customer should consider calling their insurance company before shipping the car. The customer can tell the insurance company where the car will be shipped and ask if any additional coverage should be considered. Some auto moving companies offer additional insurance products, but that doesn’t mean these products are beneficial to the customer. The customer’s insurance company may offer the same thing for less money. In other cases, the customer could end up with double coverage, which can become extremely complicated if the car is damaged and an insurance claim needs to be filed. Some auto transport service companies are actually car shipping brokers who mediate between the customer and the auto transport service company itself. This means that the brokers don’t actually perform the service of transporting the customer’s car. Instead, they earn a referral fee by matching the customer with an independent auto transport service company. Working with a broker can be convenient and help the customer find the best price quickly. But, considering how competitive the auto transport industry is and how many new companies are entering the picture, it’s important to work with a company who has a stellar reputation with the public. Financial cost shouldn’t be the only factor when choosing an auto transport service company. For example, while terminal to terminal vehicle shipping is more cost effective, door to door delivery can save the customer a lot of time and trouble. However, some restrictions may apply when choosing door to door delivery. This is because auto haulers can be small single car carriers, but they can also be 60 to 75-foot rigs which carry eight to ten vehicles at a time. If the auto hauling company is using a large truck, access to the customer’s pick-up and/or drop off location may be restricted by the presence of low lying trees/limbs, hills, gated communities, narrow streets or other physical obstructions. Under these conditions, the carrier may ask the customer to meet them at a nearby location to drop off or pick up the vehicle. The geographical location of the customer’s origin or delivery point(s) could make a big difference in the price of shipping the car. For example, a car being shipped from Utah to Michigan will cost more than a car being shipped between California and Michigan. This is simply because the California/Michigan route is more popular. This means more vehicles are shipped between these locations, lowering the overall price per mile for each customer. Inclement weather conditions can also make a difference in price and risks of vehicle damage. Whenever possible, it’s always better to have a vehicle shipped when the rig drivers are less likely to encounter dangerous weather. How Much Does It Cost to Ship a Car? Get Your Quote Now! Fill out our vehicle shipping quote form to get a hassle-free quote right now.